While it may seem that Chinese coffee has suddenly burst into the market, it is actually been brewing for over a century. It’s a story that began in 1892 with a French missionary planting a young coffee seedling in the Yunnan province. The plant thrived with small amounts of coffee grown in the region until 1988 when a joint venture between Nestlé and the Chinese government kick-started commercial production. The entry of Starbucks into the market in 1999 and its investment with farmer support activity in 2013 showed how important this market was becoming. Underpinning all this was a young generation of Chinese enjoying coffee and becoming aware of the opportunities that coffee presents. It’s this generation who have laid the foundations for an exciting coffee culture of dedicated and impassioned Chinese roasters and baristas bringing in new ideas and innovation. Last year when I spoke to Ted Lingle, Senior Advisor of the Coffee Quality Institute, he was passionate about the growth of the number of Q Graders in China and the way growers in Yunnan were embracing the idea of specialty coffee. Coming from the guy who wrote the Cuppers Handbook and developed the Q Grader program, this was saying something. Disclosure here – Ted has long been a personal coffee hero of mine. China isn’t a member of the ICO, which means its production figures aren’t verified, but the 2015 ICO report estimates it could rank as the world’s 14th largest producer. This is quite amazing growth considering the 2015 ICO report suggested China was the 30th largest producer in the world. Approximately 71 per cent of China’s crop production is exported to five countries: Germany predominately, followed by the United States, Belgium, Malaysia, and France. The Coffee Association of Yunnan estimates that the 2015/16 crop production will hit 130,000 tonnes. My first awareness of Chinese coffee was in the mid-90s when I was working in London for a large Italian brand. A sample of green Chinese coffee was sent in error to London instead of Italy. Compared to the pristine green beans on display in our training centre, these were more ivory coloured with plenty of brown and black beans. By chance, we had our head buyer visiting so I decided to use my miniscule knowledge of green beans at the time and commented on its quality. The buyer looked at the beans carefully then expertly flicked aside the worst of the beans. His comment was along the line of: “This is today. It won’t be the quality in the future.” Clearly he saw something in those beans back then and he’s been proved right. It was a conversation that came to mind last year when our first container from a Chinese producer arrived – a mix of washed and natural beans. On the cupping table, the beans scored in the mid-70s. They were clean, mild, and had very subtle fruit notes. The difference between the washed and natural was noticeable but very subdued. The coffee sold OK but it didn’t spark much enthusiasm. The big leap forward was when Shirley Liu from Cofi-Com’s sister company, Volcafe Yunnan, visited in 2017 with samples. These beans were a lovely, deep green colour and well graded. Shirley explained how the coffee was from the Meng Lian region of Yunnan, farmed by one of China’s oldest minorities, the Lahu. In ancient times, the Lahu hunted and ate tigers, the word “la” meaning tiger and “hu” meaning roasting the meat sweetly. Sadly today, the tigers are long gone but the Lahu community has been growing coffee for the past 20 years, along with tea and other vegetables. The coffee grows on the fertile slopes of the Palian Mountain at an altitude of 1400 to 1800 metres above sea level, and the trees receive plentiful rain from the river valleys to the east and west. Warm, moisture-laden air from the Bay of Bengal and Beibu Gulf protect the trees from cold and frost that could be a problem at the high altitudes. It’s easy to see why the climate has been compared to Colombia and Indonesia. Harvest in Meng Lian is between October and March and all the coffee is handpicked. Cherries are put into water so the floaters (under-ripe or underdeveloped cherries) can be skimmed off and the remaining cherries pulped. The cherries are soaked in fermentation tanks for 48 hours to remove the mucilage with the parchment sundried on concrete patios. The dry parchment is transported to Meng Lian Paliang Coffee Processing Plant for hulling, grading, and bagging. Volcafe’s field team trains the industrious Lahu farmers about quality processes, harvesting, and plant care. These producers play such a large and critical part in the increased quality of China’s coffee. As we cupped the coffees with Shirley in the Cofi-Com Lab, everything she had been talking about made sense. In front of us was a coffee that was crisp with liquorice, toffee, and chocolate notes, and had a good body and medium acidity. In fact, when I cupped it blind with a few roasters later, most of us tagged it as a mild Central American. Yunnan coffee has found a home as a great blender, competitively priced with good availability. Chinese coffee is going to be fascinating to watch. As relatively new players into the market, producers see the added value of specialty coffee into their export and domestic markets. Anyone who visits Yunnan would quickly see the investment in the region’s infrastructure and the commitment to the growth of its coffee industry. Growers have also been experimenting with Bourbon and Typica cultivars instead of the widely grown Catimor varietals, which will suit the specialty market. 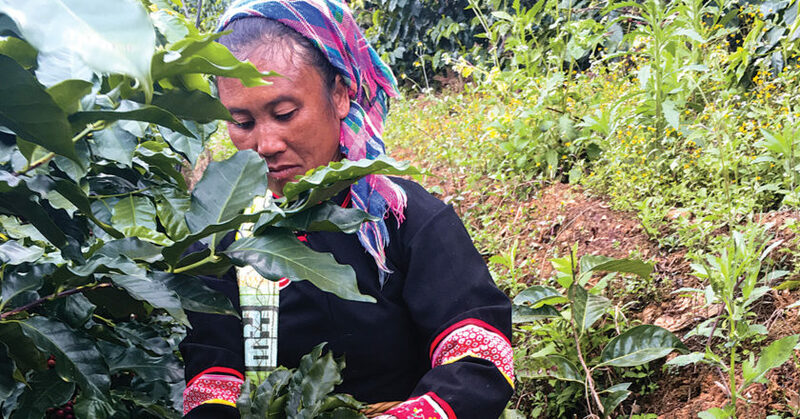 Like many coffee growing origins, Yunnan growers have to battle coffee rust disease and stem borer pests, which are being tackled through varietal research. With coffee growing border neighbours like Vietnam, Laos, and Myanmar, and regional growers like India, Indonesia, Papua New Guinea, and Australia, this is an issue that affects everyone. It’s not beyond the bounds of possibility in the decades to come that all these countries become part of a new coffee powerhouse. One last thing – remember that coffee tree the French missionary planted? It’s still there in what is now the village of Zhu Ku La in Yunnan, a testament to the resilience and longevity of Chinese coffee. This article was written by John Russell Storey, Marketing Manager of Trade at Cofi-Com. It appears in the February 2018 edition of BeanScene magazine.